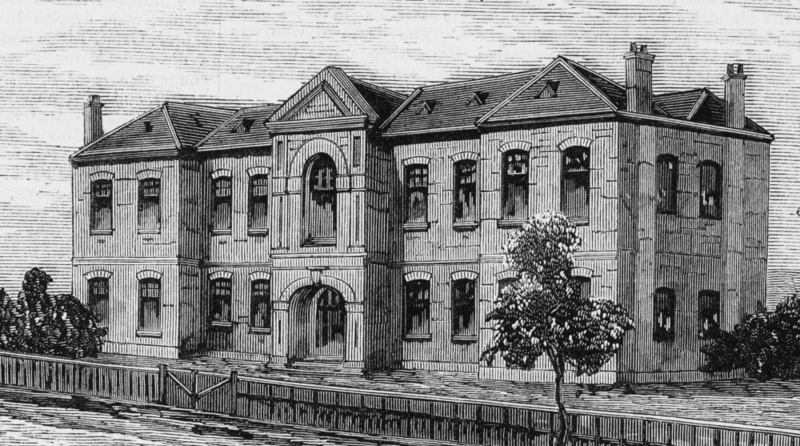 Amongst the most useful of the institutions born of philanthropy which have been established around Melbourne, the Servants’ Training Institute deserves to take a foremost position. 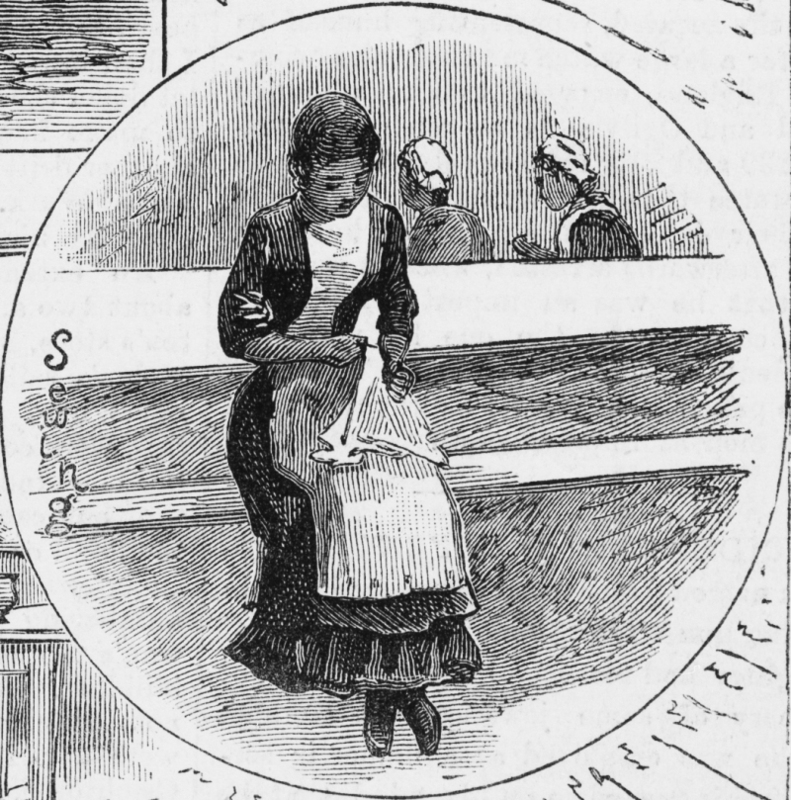 The institute has now been established about four years, its object being to prepare young girls for domestic service, more especially those who, from the death of their parents or any other misfortune, have become dependent on the State, but only girls of good character can be admitted. The work was until recently conducted in a rented building, at Vaucluse. Richmond; but the generosity of Mrs. Austin, of Barwon Park, in offering a gift of £700, conditionally on a further sum of £1400 being raised by public subscription, enabled the committee, which is presided over by Mrs. Moorhouse, to erect a building of their own at Yarra Park, near the corner of Punt road, at a cost of about £2500, a portion of which sum, however, yet remains to be obtained. The building, which was completed about two months ago, consists of two stories, and contains 16 rooms, including two large dormitories and a schoolroom. There are at present in the institute 28 trainees; of these, 26 have been received from the industrial schools, the Government paying 5s. per week each towards the cost of maintenance. The remaining 2 have been placed in the institute by parents who, being unable to look after their children, contribute towards their support whilst they are training. The age at which trainees are received is generally 12 years, but in some cases they have been taken at 10, and the maximum is 15 years, beyond which none are retained. The course of instruction nominally covers three years, but this, in a great measure, naturally depends upon the intelligence and aptitude of the girls, some of whom are fit to take situations long before the expiry of the term named. 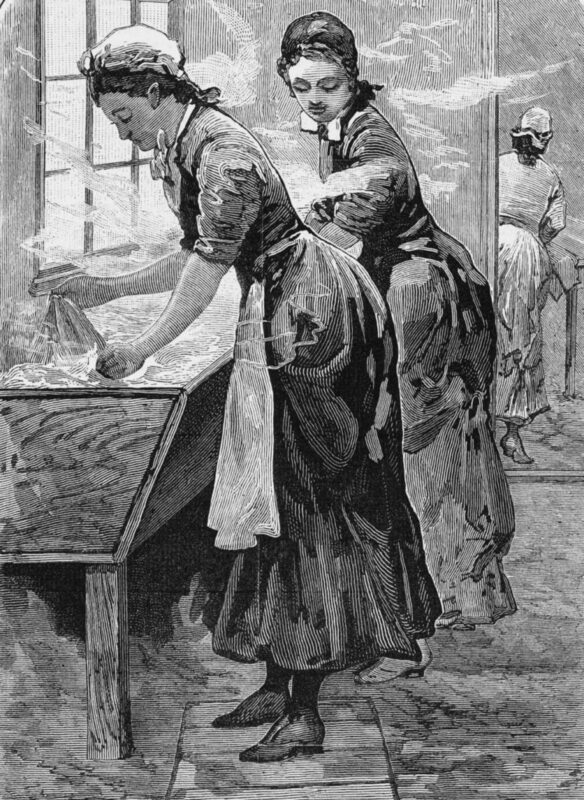 The instruction is comprehensive and systematic; the girls having their duties changed periodically, so that they go by turn into the kitchen, the laundry, the scullery and all other departments, and the care and attention exercised in the supervision of the work by the matron, Miss Macfarlane, and her staff are sufficiently illustrated by the order and the scrupulous cleanliness which prevail throughout the establishment. The girls, who appear to be well clad, well fed, healthy and contented, devote two hours each afternoon to scholastic duties until they gain the ordinary educational certificate, or if they are sent out to a situation before receiving the certificate, the condition is imposed that their employers shall see that they receive instruction. Close upon 30 trainees have gone into situations since the institution was established, and except in the case of 2 the wages received are of a very satisfactory character. Applications for the services of trainees have to be sent through and approved by the committee, and they are much more numerous than can be supplied at present, but when the financial condition of the institute becomes improved, and some necessary additions are made to the building, it is probable that a greater number of girls will be received. Until the girls reach the age of 18 they remain under the supervision of the institute. They are visited by the matron and themselves visit the institute at certain periods, and their wages are deposited in a savings bank and become available to them at the age named, when they are free to do as they please. The interior of this ugly and workhouse-reminding edifice is not very homelike, but it is commodious. To the left of the entrance hall is a long room, schoolroom and dining room combined, for the use of Inmates. Along one side of this room are two rows of desks and forms, fixed to the floor à la mode of the state schools, along the other side the long bare dining table and forms. The kitchen is immediately behind this room, and through a window in the partition wall, the sub-matron hands the meals to the hands eager to receive them. A storeroom and a scullery adjoin the kitchen. To the right of the hall are four rooms, two front and two back with a housemaid’s pantry between them. Two are intended for the matron’s use one is the committee room, and the other is used for mangling and storing linen in. Upstairs we find three dormitories. Two of them have a few spare beds, and the least one is empty of the inmates it was intended for. Sometimes it is used for hospital purposes. The sub-matron’s room, dividing the occupied dormitories, a small bedroom, a clothes room, and the bathroom complete the indoors accommodation. The bathing arrangements are exceedingly neat and convenient, excellent in every way, save that hot water is not provided. 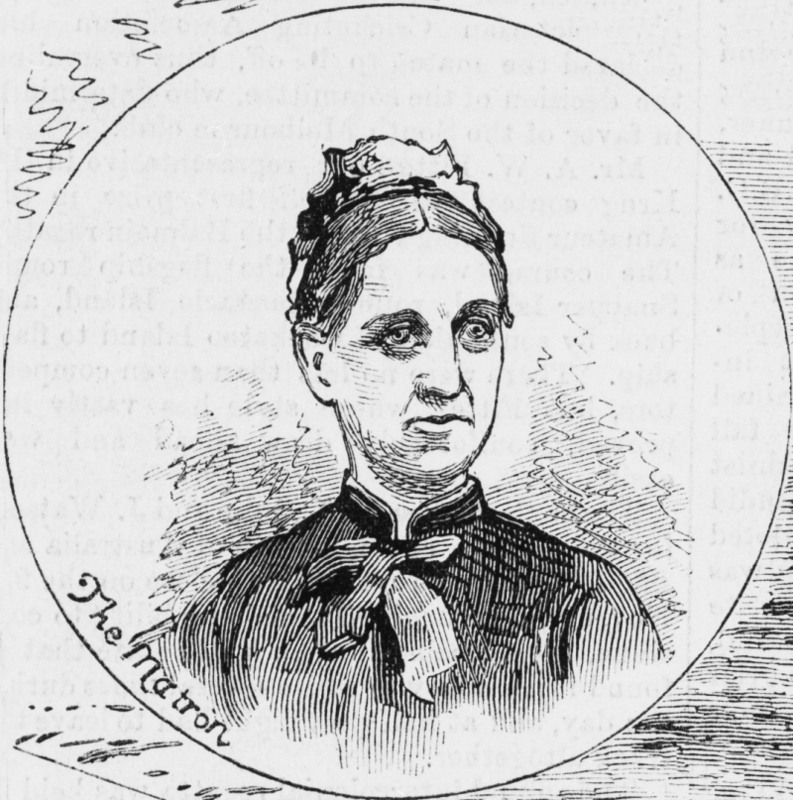 In spite of “Senator Grimaldi’s” dictum, really to cook requires the subtle, delicate, yet tenacious mind of woman (a position that might be questioned), I have not heard of any pupil from this school yet distinguishing herself as a cook. Perhaps that indicates that the art of cookery requires a higher order of mind than is usually to be found here. 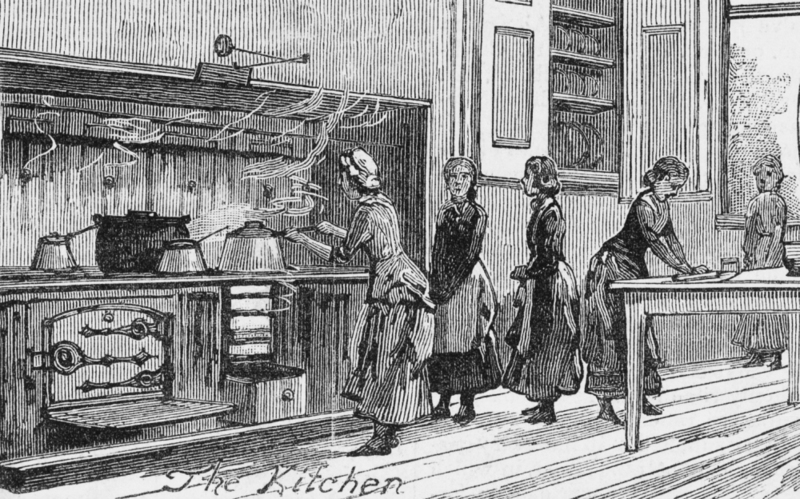 The girls have every opportunity of seeing “plain cooking, very good of its kind, for they are remarkably well fed not only in quantity but in quality. Each girl serves two months in the kitchen, two months in the house, and two months in the laundry in rotation, so as to gain an insight into all branches of work. The hours and rules are more elastic than in most institutions, but the general rising hour is about 7 a.m. The girls go to their work in laundry, kitchen, or house until 8, then they assemble in the hall and march in procession, singing an old fashioned grace, to their diningroom. Here the matron reads a portion of the Church of England morning service and a psalm, and after a hymn and another grace, the meal proceeds. The matron reads to the inmates during meals sometimes the Arabian Nights. After breakfast the work proceeds vigorously, the greater portion of what is to do must be done in the forenoon, as two hours in the afternoon are devoted to lessons. With one of the larger state schools within a stonecast I must confess it seems to me an enormous waste of power to provide separate instruction indoors for 21 girls. If other boarded out children can be trusted to go to state schools, why not these? The task of instruction is undertaken by the matron, and she would not find it irksome but for the fact that all visitors to the institution seem to make a point of coming during school hours and the matron has to receive them. The girls, unlike the children of the wealthy, but like most of those who labour–not too hardly–with their hands, take great pleasure in their lessons and for the two school hours are on their best behaviour. Among them is as large a proportion of those who may be called “quick in the uptake” as in any other class of children. Some of the faces are preternaturally shrewd, and “knowing,” but not with school knowledge. Good looks are strikingly absent. After lessons are over the girls play until tea time, at half post 5. The necessary clearing up preparations for next day, stocking and clothes mending, and evening prayers brings them to bed time, about 9 p.m.